How old should children be for a walking holiday? Is there a ‘perfect age’ for introducing your offspring to the delights of the great outdoors? With regards to age limits, we firmly believe no child is too young for a walking holiday. There may well be some carrying involved, but the person doing the job will benefit from the extra fitness and muscle tone! Hiking with babies and toddlers is not as overwhelming as you might think. It just requires a little more planning (and, occasionally, patience!). Child carriers are recommended as the best way to transport babies and toddlers on your adventures. Ensure you select a model with adequate suspension as well as padded shoulder straps and waist belt. A rain / sun hood is also essential. Do check on your ‘carried’ children regularly. A sleeping child may be peaceful but can still be hot, cold, or uncomfortable. Apply sunscreen to all exposed areas before you set off. There is much to be said for hiking with babies and toddlers. As long as you have the right baby carrier, they will not slow you down – although you are likely to make more regular stops for breaks, feeds, nappy changes, etc. Your passenger will not only enjoy their elevated view, but it also provides a unique opportunity for parent and child to connect. 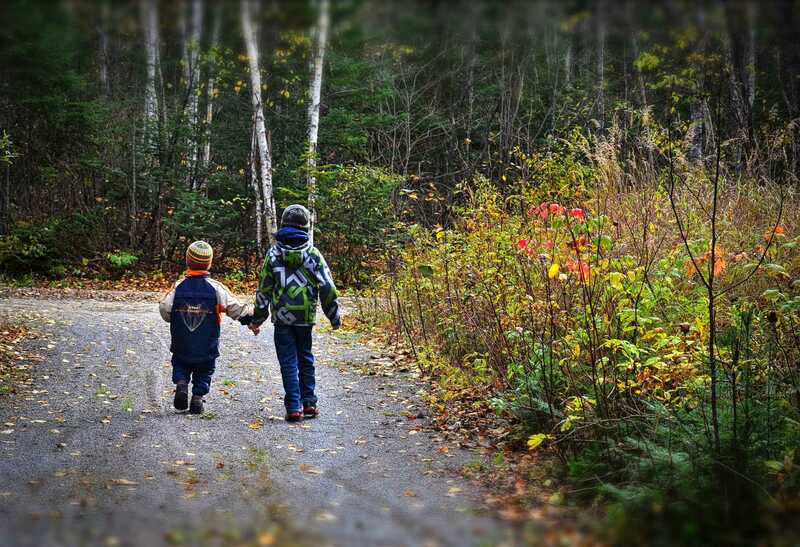 When hiking with little ones, you will need to plan your destination and your routes carefully. Avoid trails with steep climbs and loose rocks as these will affect your ability to balance while carrying a child. Think also about the weather conditions. Babies can’t regulate their body temperature like adults can so extreme cold or heat should really be ruled out. For babies in pushchairs, there are many circular, low-level walks along lakes and rivers where you can enjoy the mountain scenery reflected in the glassy waters – and with plenty of paddling and swimming opportunities thrown in for those who wish to partake. Indeed, it is not a good idea to take very young children on high-altitude treks anyway, because they may struggle to acclimatise. The biggest challenge of all when walking with babies is probably just how much gear you need to take with you – your child or children probably require a lot more than you do. Changes of clothes, wipes, milk and snacks can all stack on a lot of extra weight – just as they do in everyday life! For many parents, the most challenging age to go walking with children is that ‘in-between’ stage from around three to six years: too heavy to be carried, but still too small to walk a long way by themselves. The best thing to do is to start slowly as you introduce them to the world of walking. There’s nothing worse than dragging along tired and fed up children, so for your first adventure, find an easy trail that has lots to entertain them on the way around (such as a playground, picnic area, waterfall, swimming lake, wildlife). And be sure to get them excited about it beforehand. Talk to them about the trip in advance and get them involved in the packing process so they can understand what everything is for. As you walk, point out everything that is potentially interesting to them (insects, flowers, rock formations) and show them where you are on the map. The more involved they feel, the more excited they will become. As with the younger kids, the best way to make a success of a trip with your school-aged children is to involve and engage them in every stage of the adventure. Teach them how to use a map, and let them take turns in leading the group. Assign each child a task, such as spotting a particular flower and challenge them to take photographs of their finds. Identify check points on your route that have something interesting to see or do and be sure to keep praising them when they excel in their hiking exploits! This is often the age when the tables are turned and the children are fitter and more adventurous than their parents! You may well find that your teenagers will prefer the more challenging mountain hikes, or perhaps those with some other activity included along the way (such as an easy via ferrata – with the right equipment).